This is a question that I am frequently asked when I speak about conscious evolution – the potential we have to transform ourselves and our institutions in time to avoid irreversible deterioration in our quality of life. I know we have all the ingredients to do the job, I tell them. What I don’t know, I add, is whether or not we have the collective will to do it. So here is the question facing us: Do we have the collective resolve to choose a path different from the one we are presently on? Dictionary.com defines resolve as “a resolution or determination made, as to follow some course of action; firmness of purpose or intent; determination.” I call this intent or purpose “conscious evolution” – to proactively determine to evolve in a way that is sustainable, mature and respectful of all of Nature including our fellow human beings. 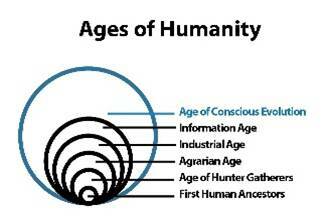 Humans are a recent product of Nature’s 4.54 billion year evolutionary journey on this planet. We are a very young species, still pretty much in the adolescent stage of our development. 2012 is the year to declare that we’re ready to make the passage into adulthood — to consciously choose to take responsibility for the well-being of all life. The well-being of our children and their children are dependent on the well-being of all life. We can demonstrate our passage into adulthood by learning what it takes to consciously evolve ourselves and our social systems in ways that serve all of life. The evolution of our biosphere is our best example of an “infinite game.” Today’s social systems (education, healthcare, commerce, governance, etc.) overflow with examples of devastatingly “finite games.” Conscious evolution can be seen as a commitment to transform these systems from finite to infinite games. Back to the question facing all of us: Do we have the collective resolve to choose a path different from the one we are presently on? Do we have the collective resolve to consciously choose a path of sustainable living and abandon the unsustainable path we are headed down today? Hubbard states that conscious evolution is a movement, but movements are self-propelling and don’t require leaders. This will be a movement when vast numbers embrace it as a new way of living and working. That is, when it becomes a new habit for the human race, replacing the habits that have brought us to the brink of human extinction.